In this talk, Dr. Hussain raised awareness about the magnificent Buddhist Stupa once located in his native city of Peshawar, Pakistan, a building that was, by “all measures, the 8th wonder of the ancient world.” He argued for acquiring the excavated land of the Stupa and declaring it a World Heritage Site. 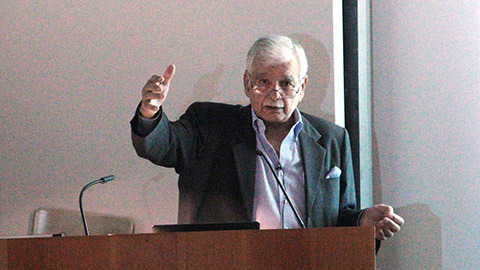 Dr. Sayed Amjad Hussain is Emeritus Professor of Thoracic and Cardiovascular Surgery in the College of Medicine and Life Sciences, Emeritus Professor of Humanities in the College of Arts and Letters, and Op-Ed Columnist for The Toledo Blade. The lecture was held at the Haigh Auditorium, Center for the Visual Arts.